Man, a crack biographer of Asian historical figures (Ninja: 1,000 Years of the Shadow Warriors, 2012, etc. ), tenders a survey of the samurai, the equivalent of Japan’s feudal knights. This is a well-written piece of history with an easy storyteller’s rhythm and plenty of intrigue. Readers will quickly realize that the author, who previously worked for Reuters and Time-Life Books, is well-versed in Far Eastern history, but he also accommodates new discoveries and insights. To understand the samurai, it is critical to understand the nature of the Japanese political landscape, “a patchwork of sixty provinces and six hundred estates, all scrapping with one another.” The lords found protection in landowning warriors—samurai—who were gifted land by the lord and gathered wartime booty. There also arose a strict code of conduct within the samurais’ elite community. They were generous, stoic, intelligent, and masters at swordplay and spiritual matters; they also realized that there was often no way out but death, which tended to make them rather fearless. But times change, and Mann intricately describes the shift in the orientation of the Japanese government after the post-1600 revolution: the rise of the shogun and the banning of warfare. 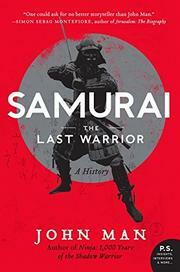 In these peaceful years, the samurai could have disappeared, but they survived. “The key to their survival,” writes the author, “was the way they renewed their sense of identity, not by abandoning the past but by cherry-picking aspects of it to suit new circumstances.” The samurai became enforcers of the peace; they could kill at the drop of an insult, an act of adultery or out of revenge. But they were also schooled in the art of speaking and “of attitude, of clothing, of intellectual vigor”—a ready-made diplomatic corps.